Elliptical Consoles: What are the general features to look for? You will find that elliptical trainer consoles have many of the same functions as treadmill consoles, but due to structural design, an elliptical console is generally smaller. That means that the layout needs to be more efficient in providing you with the programming selections and the feedback displays. Treadmill consoles often have numerous windows, providing simultaneous feedback. With ellipticals many of the functions will be combined to reduce the required space. Typically, ellipticals display important stats like speed, time, calories, resistance level and time. With the budget models the information is displayed in a very simple and basic fashion. With more expensive models you will get more sophisticated information, providing a variety of feedback, monitoring and guidance. With a console, look for controls and buttons that are easy to reach. You want a display that is easy to read and interpret. The displays are generally LCD or LED. Some LCD displays found on cheaper models are not back-lit and can be difficult to see, especially in poor lighting. 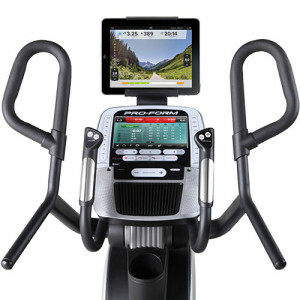 Higher end machines might include a web-enabled touchscreen that shows virtual running courses or allows you to surf the web while you exercise. Many machines also now incorporate an integrated tablet holder where you can place your connected smart device to play Netflix or view websites. Who doesn’t want to enjoy their favorite TV shows and blogs while they’re working out? This can be a great feature for motivation and entertainment. Most elliptical trainers offer some type of programming. For many, programming can be important in providing motivation by keeping your routines fresh, varied and challenging. Programs allow you to compete against yourself in reaching new benchmarks and fitness goals. They can achieve faster results and sustain your motivation by providing a point of reference as well as a goal. Examples of elliptical trainer programs are target time, target distance, target calories, fat burn, hill climbing, interval and endurance. If the machine is equipped with heart rate control, you will have one or two programs that set the level of your exertion based on your heart rate. Some consoles have the option to save multiple user profiles. This can be handy if you are sharing a machine with multiple members of the household. These days, almost all of our recommended machines include some sort of programming to track your fitness and measure your results. 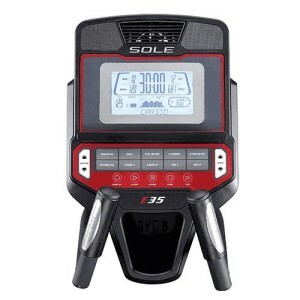 Sole Fitness has a less fancy LED display on a very well-built and durable machine. In addition, they have Bluetooth technology built into their machines, so you can link your machine to an online account, track your workouts, and watch your progress towards set goals. You can download a free Sole Fitness app that links to your machine and many popular apps you may already be using (like MyFitnessPal and AppleHealth). Many of the programs on modern ellipticals vary the intensity of the workout by changing the level of resistance and thus your heart rate. High intensity interval training (HIIT) has proven to optimize your workout by getting more results in less time. Some brands, like Matrix Fitness, incorporate HIIT training programs right on their consoles. The program from Matrix is called Sprint 8 and now comes pre-programmed on some Matrix models. Two Icon Fitness companies, NordicTrack and ProForm, offer perhaps the best twist on exercise programs — iFit. iFit offers two-way communication between your elliptical trainer and the Internet. You log into iFit.com and create a personal account that defines your fitness goals, like losing a certain amount of weight over a defined period. iFit will download a new personalized workout routine every day based on your goals. Each workout will get progressively harder and include audio coaching. You can also take advantage of the coaching feature by accessing one of the 1,200+ interactive videos in the iFit library. Each video is led by a world-renowned trainer who will adjust the incline and resistance of your machine to ensure you’re getting the best workout possible. Like on Horizon’s ViaFit, your workout data and stats are fed back to iFit, where you can track your progress, and individuals who monitor their progress are more likely to reach their goals. One thing that makes iFit stand out is this next feature. iFit also includes Google Maps, where you can define a route virtually any where in the world and simulate running the terrain with your elliptical. By using a tablet or smart phone, or HD Touchscreen on your machine, you can get either get a map, satellite, earth or street view of your route as your progress. NordicTrack and ProForm can be a little confusing in how they designated the level of iFit programming on their machines. Essentially, it’s determined by whether you need a smart device of your own, or if your machine has an HD Touchscreen display. You get a 1-year iFit membership with your purchase, but only on machines that come equipped with an HD Touchscreen. Models without that feature give you the option of purchasing a membership and require you to provide your own smart device. Plus, some iFit machines require an additional wifi module purchase to connect the machine to the online account. We broke down the different types of iFit machines in this article. It should be noted that iFit requires an ongoing paid subscription to use. If you purchase an iFit machine and choose not to activate your iFit, then you can’t take advantage of these features. That can be a good or a bad thing. NordicTrack and ProForm tend to offer more ‘bang for the buck’ in terms of features. 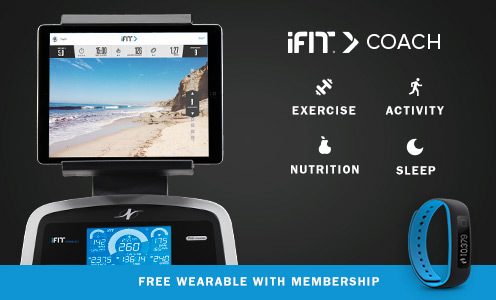 If you choose not to pay for the iFit, you are still paying less money overall for a pretty snazzy machine. Or, if free workout tracking, better durability, but perhaps lower specs for the money sound good to you, then you should consider an elliptical from a brand like Sole, Horizon, or Bowflex. If you have more questions, check out our Elliptical Buyer’s Guide. Plus, check out our top recommendations on our Best Buy Ellipticals page.